ROCHESTER — Some of Rochester’s youngest scientists paid a visit last week to check in on progress toward new outdoor classrooms and other amenities in the Hanson Pines and Cocheco River area. Last spring, Maple Street Magnet School students reached out to Rochester’s Riverwalk Committee to forge a partnership that will help develop portions of the Cocheco River and Hanson Pines areas into outdoor learning spaces. Since then, students have conducted fundraising, brainstormed ideas and contributed to planning and design of outdoor classroom spaces. The Riverwalk committee is working closely with students to identify options for other new installations, which will ultimately require the approval from the Hanson Pines Trustees and the City Council. Students will take on an active role in navigating the approval process by presenting to the two boards and defending their proposals publicly. On Wednesday, April 3, students and members of the committee visited those areas as a first step in the next phase of a year-long project. There they discussed ways to incorporate hands-on learning that would allow students to better connect with nature in their own community. Students have developed several ideas, which they’ll continue to work on with the committee to build upon and determine how to make them a reality. Some of their ideas included places to climb, an obstacle course, a bird watching station, science center, information stations and signage. As part of the group’s next steps, they have identified options for outdoor classroom layouts and are working to identify and install signage that will inform visitors of all ages about the environment, wildlife and natural elements that surround them on the trails. ROCHESTER — City Manager Blaine Cox and Planning and Development Director Jim Campbell wish to invite residents to the first of two public discussions on Rochester’s Transportation Master Plan. 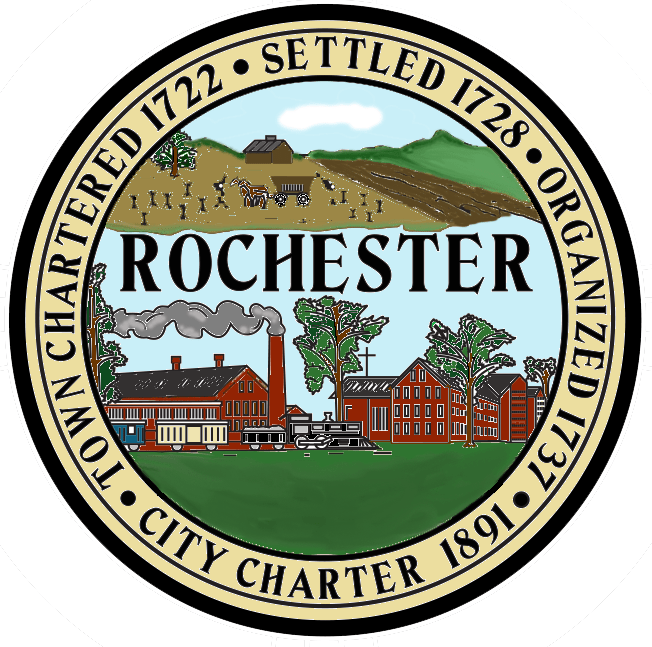 Thursday, April 4, at 6:30 p.m.
Members of the community are encouraged to attend Thursday’s meeting to share their thoughts on existing transportation conditions in Rochester, as well as their vision for options and improvements they would like the city to prioritize in the future. The meeting is designed to serve as an open forum where residents, business owners, property owners and city officials can share their ideas about the future of transportation in Rochester. City consultant VHB will present information to attendees and collect input and ideas through a workshop format. ROCHESTER — City Manager Blaine Cox is pleased to announce that the Rochester Farmers Market has named a new manager for the 2019 season. she will continue in her existing roles as entertainment manager for the Deerfield, Belknap and Stratham Fairs, as well as the Hampton Seafood Festival and Wings and Wheels Rochester. Poland will take over for two Farmers Market founders, Jeanne Grover and Alicia Frye, who had committed to manage the organization through the 2018 season. The pair also founded the Vouchers for Veterans program, which they are now working to expand throughout Strafford County. The market will be held every Tuesday from 3-6 p.m. at the Rochester Commons, starting June 11 and continuing through Sept. 24. As in past years, the market will feature both a variety of quality vendors and diverse live entertainment options. ROCHESTER — Mayor Caroline McCarley provided residents with key updates about the city of Rochester, and took part in a discussion about their individual feedback at the informal Coffee With the Mayor event late last week. On Thursday, Dec. 13, residents and city employees joined the mayor at the Governor’s Inn for a wide-ranging discussion about what the city accomplished in 2018, as well as what they’d like to see city leaders prioritize in 2019. The mayor praised newly-named City Manager Blaine Cox for his early work transitioning into his role following the retirement of his predecessor, Dan Fitzpatrick, and highlighted several other key developments. Among them were the re-paving of streets downtown, improved sidewalks, expanded bike lanes and the installation of new way finding signage in the business district. The conversation was meant to give residents an opportunity to hear about the progress their city is making, and also provide critical feedback to guide the city’s future. McCarley also noted the difficult decision to raise the city’s tax cap this year, which was done largely to ensure adequate funding of the city’s schools. McCarley said that a delegation from Rochester will be going to the state capitol soon to advocate for continued state support of the ongoing renovation at the high school’s Creteau Technology Center, and indicated that she’d ask the city council next month to identify its top three priorities for the year to come. For her part, the mayor said she hopes to one day see a covered market take hold in the Hoffman building and is looking forward to the responses to the recently-issued request for proposals for the Scenic Theater and Salinger Block on North Main Street. She also hopes that the Rochester Fair complex will become a stronger asset for the community. Residents at the event expressed praise for the improvements downtown, and some suggested they’d like to see improvements like better lighting at some of the crosswalks in the city. To conclude the event, attendees provided feedback about projects that they believed might improve the Riverwalk.